While disruptive technologies speed up the world, a growing number of public and private organizations require increased control over their data. Open source software is the key to such control. Kopano and Mattermost jointly bring the Slack and MS-Teams experiences into a self-hosted, transparent environment 100% under the own IT departments control. Mattermost is now available with Kopano DeskApp and WebApp. “Kopano aims to the be the complete platform for integrating modern, flexible communication and collaboration technologies – not just an alternative to standard groupware offerings, but going well beyond” says Brian Joseph, CEO of Kopano B.V. “The tight integration of Mattermost technology complements our existing groupware, video and file sharing solutions with ChatOps and advanced group collaboration management”. 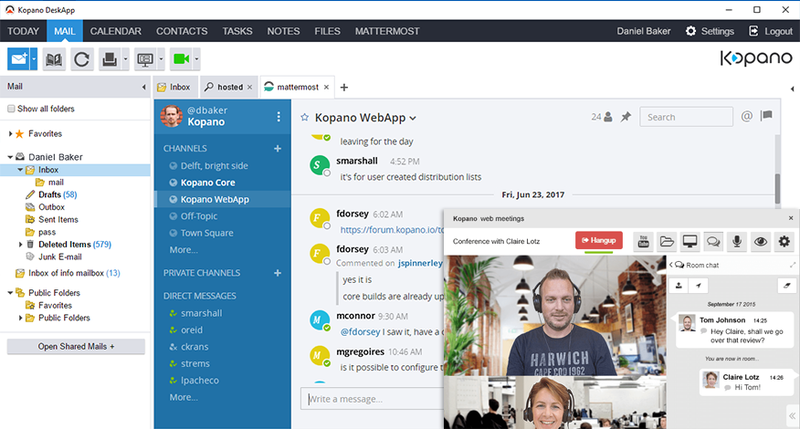 With the upcoming Webmeeting 4 version , Kopano integrates its WebRTC solutions for video, audio and screensharing into the Mattermost chats. The first version will be shown at the Kopano conference in The Netherlands on September 28th 2017. This is in line with Kopano’s new strategy to offer a full integrated stack of collaboration tools, but in a very flexible way. The Kopano Webmeeting 4 version can be installed and used independently from the other Kopano features. This allows the installation together with Mattermost in any organization regardless of other existing groupware solutions. Kopano continues this with the upcoming Kopano Documents feature. Mattermost helps extending Kopano’s modular architecture beyond groupware to become a platform for importing, searching and managing all enterprise messaging, notifications and alerts, irrespective of how fragmented a customer’s infrastructure might be. It is built to improve how people communicate with organizations and applications and leverages an open source platform that is entirely extensible with a vast array of third party integrations and plugins.